CarePAK PRO provides accidental damage protection for peace of mind. To purchase, please contact an Authorized Cinema Dealer. Only CFast 2.0™ with VPG-130 is supported. The limited warranty set forth below is given by Canon U.S.A., Inc. (Canon U.S.A.) in the United States or Canon Canada Inc., (Canon Canada) in Canada with respect to the Canon brand EOS Digital Camera (the “Product”) *, when purchased and used in the United States or Canada. The Product purchased with this limited warranty is the only EOS Digital Camera to which this limited warranty applies. Canon U.S.A., Inc. and Canon Canada Inc. (collectively "Canon") warrant to the original end-user purchaser, when delivered in new condition in its original container, that the Product will be free from defects in materials and workmanship under normal use and service for a period of one (1) year from the date of original purchase. Product returned to a Canon repair facility and proven to be defective upon inspection will, at Canon’s sole discretion and without charge, be (a) repaired utilizing new, remanufactured, repaired and/or recycled parts; (b) exchanged for a new Product or; (c) exchanged for a refurbished Product, as determined by the Canon repair facility. Warranty exchange or replacement does not extend the original warranty period of the Product. THIS WARRANTY DOES NOT COVER ANY ACCESSORIES. This limited warranty shall only apply if the Product is used in conjunction with compatible computer equipment and compatible software, as to which items Canon U.S.A. or Canon Canada, shall have no responsibility. Non-Canon brand equipment and software that may be distributed with the Product are sold "as is" and without warranty of any kind by Canon U.S.A. or Canon Canada, including any implied warranty regarding merchantability or fitness for a particular purpose, and all such warranties are disclaimed. The sole warranty, if any, with the respect to such non-Canon brand items is given by the manufacturer or producer thereof. NO IMPLIED WARRANTY, INCLUDING ANY IMPLIED WARRANTY OF MERCHANTABILITY OR FITNESS FOR A PARTICULAR PURPOSE, APPLIES TO THE PRODUCT AFTER THE APPLICABLE PERIOD OF THE EXPRESS LIMITED WARRANTY STATED ABOVE, AND NO OTHER EXPRESS WARRANTY OR GUARANTY, EXCEPT AS MENTIONED ABOVE, GIVEN BY ANY PERSON OR ENTITY WITH RESPECT TO THE PRODUCT SHALL BIND CANON U.S.A. OR CANON CANADA (SOME STATES AND PROVINCES DO NOT ALLOW LIMITATIONS ON HOW LONG AN IMPLIED WARRANTY LASTS, SO THE ABOVE LIMITATION MAY NOT APPLY TO YOU)..NEITHER CANON U.S.A. NOR CANON CANADA SHALL BE LIABLE FOR LOSS OF REVENUES OR PROFITS, INCONVENIENCE, EXPENSE FOR SUBSTITUTE EQUIPMENT OR SERVICE, STORAGE CHARGES, LOSS OR CORRUPTION OF DATA, OR ANY OTHER SPECIAL, INCIDENTAL OR CONSEQUENTIAL DAMAGES CAUSED BY THE USE OR MISUSE OF, OR INABILITY TO USE, THE EOS DIGITAL CAMERA, REGARDLESS OF THE LEGAL THEORY ON WHICH THE CLAIM IS BASED, AND EVEN IF CANON U.S.A. OR CANON CANADA HAS BEEN ADVISED OF THE POSSIBILITY OF SUCH DAMAGES. IN NO EVENT SHALL RECOVERY OF ANY KIND AGAINST CANON USA OR CANON CANADA BE GREATER IN AMOUNT THAN THE PURCHASE PRICE OF THE PRODUCT SOLD BY CANON USA OR CANON CANADA AND CAUSING THE ALLEGED DAMAGE. WITHOUT LIMITING THE FOREGOING, YOU ASSUME ALL RISK AND LIABILITY FOR LOSS, DAMAGE OR INJURY TO YOU AND YOUR PROPERTY AND TO OTHERS AND THEIR PROPERTY ARISING OUT OF USE OR MISUSE OF, OR INABILITY TO USE, THE PRODUCT NOT CAUSED DIRECTLY BY THE NEGLIGENCE OF CANON USA OR CANON CANADA (SOME STATES AND PROVINCES DO NOT ALLOW THE EXCLUSION OR LIMITATION OF INCIDENTAL OR CONSEQUENTIAL DAMAGES, SO THE ABOVE EXCLUSION OR LIMITATION MAY NOT APPLY TO YOU). THIS LIMITED WARRANTY SHALL NOT EXTEND TO ANYONE OTHER THAN THE ORIGINAL PURCHASER OF THE PRODUCT, OR THE PERSON FOR WHOM IT WAS PURCHASED AS A GIFT, AND STATES YOUR EXCLUSIVE REMEDY. MAIL-IN SERVICE is a program under which your Product is repaired by a Canon U.S.A. or a Canon Canada authorized service center for the Product. Authorized service center information can be obtained by visiting www.canontechsupport.com (US customers only) or by contacting the Canon U.S.A., Customer Care Center or Canon Canada Customer Information Centre at 1-800-OK-CANON (1-800-652-2666). You will be given the name, address and phone number of an authorized service center. It is your responsibility to properly package and send the defective Product, together with a copy of your dated proof of purchase, a complete explanation of the problem and a return address to the authorized service center at your expense. Do not include any other items with the defective Product. The Product covered by this limited warranty and proven to be defective upon inspection will be repaired and returned to you without charge by the authorized service center. Any Product received by the authorized service center that is not covered by the limited warranty will be returned unrepaired, or at the discretion of the authorized service provider, you may receive a written estimate of repair at such cost as the service center may establish from time to time. The limited warranty set forth below is given by Canon U.S.A., Inc. ('Canon USA') with respect to Canon Professional Digital Video Equipment (the 'Equipment') packaged with this limited warranty and purchased in the United States. This limited warranty is only effective upon presentation of your Bill of Sale or other proof of purchase. The Equipment is warranted to the original end-user purchaser, when delivered in new condition in its original container, under normal use against defective materials or workmanship as follows: Parts: Defective parts will be exchanged for new parts or comparable rebuilt parts for a period of ONE YEAR from the date of original purchase. Labor: For a period of ONE YEAR from the date of original purchase, labor will be provided free of charge by Canon USA's factory service centers or designated service facilities located in the United States. When returning Equipment under this warranty, you must pre-pay the shipping charges, and you must enclose a copy of the Bill of Sale or other proof of purchase with a complete explanation of the problem. During the ONE-YEAR warranty period, repairs will be made and the Equipment will be return-shipped to you free of charge. For repairs after the warranty period is over, you will be given an estimate of the cost of repair and an opportunity to approve or disapprove of the repair expense before it is incurred. If you approve, repairs will be made and the Equipment will be returned to you at your risk and expense. If you disapprove, we will return-ship the Equipment to you at no charge to you to an address within the United States. This limited warranty only applies if the Equipment is used in conjunction with compatible computer equipment and compatible software, as to which items Canon USA will have no responsibility. Canon USA shall have no responsibility under this limited warranty for use of the Equipment in conjunction with incompatible peripheral equipment and/or incompatible software. Non-Canon brand peripheral equipment and software which may be distributed with, or factory loaded on, the Equipment, are sold 'AS IS' without warranty of any kind by Canon USA, including any implied warranty regarding merchantability or fitness for a particular purpose. The sole warranty with respect to such non-Canon brand items is given by the manufacturer or producer thereof. If the Equipment contains a hard disk drive, Canon USA recommends that data stored on that drive be duplicated or backed up to prevent its loss in the event of failure or other malfunction of such drive. In order to obtain warranty service, please contact the authorized Canon retail dealer from whom you purchased the Equipment or contact the CANON INFORMATION CENTER AT 855-CINE-EOS (855-246-3367) or on the internet at pro.usa.canon.com/support. You will be directed to the nearest service facility for your Equipment. If the Equipment has had its serial number or dating altered or removed. This Limited Warranty does not apply to Equipment purchased outside the United States. This Limited Warranty does not apply to accessories or consumables for the Equipment, which are sold "AS IS", without warranty of any kind by Canon USA. Please retain this warranty card and your Bill of Sale as a permanent record of your purchase. This card ensures that you are contacted promptly should there be a safety inspection, modification or product recall under applicable laws or regulations. NO IMPLIED WARRANTY, INCLUDING MERCHANTABILITY AND FITNESS FOR A PARTICULAR PURPOSE APPLIES TO THIS EQUIPMENT AFTER THE APPLICABLE PERIOD OF EXPRESS WARRANTY OR GUARANTY (EXCEPT AS MENTIONED ABOVE) GIVEN BY ANY PERSON, FIRM OR CORPORATION WITH RESPECT TO THIS EQUIPMENT SHALL BIND THE UNDERSIGNED (SOME STATES DO NOT ALLOW LIMITATIONS ON HOW LONG AN IMPLIED WARRANTY LASTS, SO THE ABOVE LIMITATION OR EXCLUSION MAY NOT APPLY TO YOU). CANON USA SHALL NOT BE LIABLE FOR LOSS OF REVENUES OR PROFITS, EXPENSE FOR SUBSTITUTE EQUIPMENT OR SERVICE, STORAGE CHARGES, LOSS OR CORRUPTION OF DATA, INCLUDING WITHOUT LIMITATION, LOSS OR CORRUPTION OF DATA STORED ON THE EQUIPMENT'S HARD DRIVE, OR ANY OTHER SPECIAL, INCIDENTAL OR CONSEQUENTIAL DAMAGES CAUSED BY THE USE, MISUSE OR INABILITY TO USE THE EQUIPMENT, REGARDLESS OF THE LEGAL THEORY ON WHICH THE CLAIM IS BASED, AND EVEN IF CANON USA HAS BEEN ADVISED OF THE POSSIBILITY OF SUCH DAMAGES. NOR SHALL RECOVERY OF ANY KIND AGAINST CANON USA BE GREATER THAN THE PURCHASE PRICE OF THE EQUIPMENT SOLD BY CANON USA AND CAUSING THE ALLEGED DAMAGE. WITHOUT LIMITING THE FOREGOING, YOU ASSUME ALL RISK AND LIABILITY FOR LOSS, DAMAGE OR INJURY TO YOU AND YOUR PROPERTY AND TO OTHERS AND THEIR PROPERTY ARISING OUT OF USE, MISUSE OR INABILITY TO USE THE EQUIPMENT NOT CAUSED DIRECTLY BY THE NEGLIGENCE OF CANON USA (SOME STATES DO NOT ALLOW THE EXCLUSION OR LIMITATION OF INCIDENTAL OR CONSEQUENTIAL DAMAGES, SO THE ABOVE LIMITATION MAY NOT APPLY TO YOU). THIS WARRANTY SHALL NOT EXTEND TO ANYONE OTHER THAN THE ORIGINAL PURCHASER OF THIS EQUIPMENT OR THE PERSON FOR WHOM IT WAS PURCHASED AS A GIFT. This charger unit with a compact design, accepting just one battery at a time. Power is supplied using a CA-CP200B compact adapter. Rosette style camera grip makes rotating and removing the grip simpler, and features an improved ergonomic design to help steady and focus the camera. Enables attachment of the optional EVF-V70, offering high-quality, stress-free EVF shooting. This handle unit can be attached to the camera body without tools, and features a new handle screw that enables fast and easy attachment. The unit can also be used to mount a variety of optional peripherals. The 3-hingle attachment for the optional LM-V1 LCD Monitor allows flexible rotation of the display during shooting. Fully adjustable and detachable, this 1.23 million dot, 4 inch LCD Monitor with touch screen features Canon's exclusive AF technologies for easy monitoring and one-finger "tap-focusing" during shooting. Thank you for using Canon products. 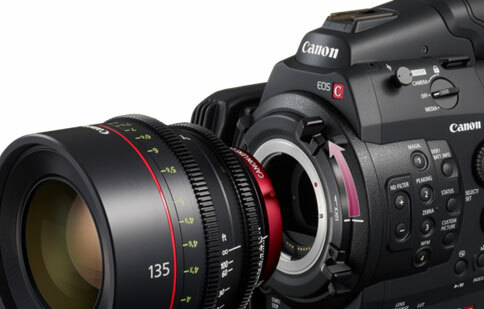 Canon has started to offer lens mount replacement service for Cinema EOS camera bodies. Interested parties can call our support centers to make arrangements for this service. For the models listed below an optional mount conversion to PL is available at Canon Factory Service Centers. If you would like to reverse to the original mount, please include the returned parts with the camera to our service facility. 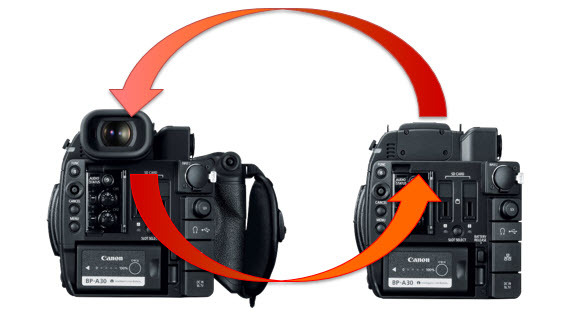 Canon is offering Viewfinder Modification for the EOS C200 and EOS C200B camcorders. Interested parties can call our support centers to make arrangements for this service. The option to add or remove the viewfinder is available for the EOS C200 and C200B models. This conversion includes replacing all covers so there are no exposed internal components. All removed parts will be returned to the customer and conversion back is also possible. Please contact us for more information.